So last time I talked about La Corda d’Oro, which is the kind of much too cliched shojo manga I wish people had the foresight not to publish in Japan, let alone the U.S. Media tie-ins make a lot of money for publishers so I can see why someone did. Still, I respect classical music a lot and I feel that manga about it must have a certain kind of intensity to it. There’s just something about the way classical music is written that, to me, feels like there is serious passion in it at all times. It’s like tasting the blood, sweat and tears of the composer. The composer worked damn hard to make that music sound like springtime for you. That’s where my next pick comes in. It shows you that world and just how much work goes into the creation of classical music. The blood, the sweat, the tears, etc. So full of passion, you can see the awesome. 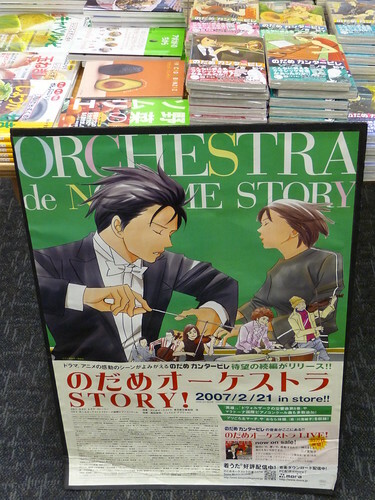 Nodame is about two students at Momogaoka College of Music, Megumi Noda (Nodame herself) and Shinichi Chiaki. Both are excellent pianists, but they couldn’t be more different. Chiaki is the school’s top student, extremely well-organized and successful and Nodame is messy, lazy and extremely disorganized. Chiaki strives to perfect his music and Nodame likes to literally play it by ear. The story starts out with Chiaki having a rough time attempting to switch majors from piano to conducting. Not only are his advisors trying to stop him, but he has a serious fear of flying, which makes it extremely tough for him to take on a new career. On top of that, he’s trying to get out of a relationship and the creepy Nodame is kind of stalking him. Chiaki winds up getting stuck helping out Nodame in class and caring for her on occasion, which begins their funny little relationship. What I really love is about Nodame Cantabile is that it feels just like being around my school friends, particularly my anime club. Everyone has different specialties, different goals, different personalities, but we can band together around one thing and work to make it great. In my club’s case, it’s being a great anime community. In the case of Nodame, Chiaki and their friends, it’s making music. Not to overgeneralize, but Nodame Cantabile is manga as it should be. It’s carefully paced and finely crafted to make the reader perfectly at home with the characters, even if they’re not into classical music at all. It’s just smooth like piano music. (How fitting…) The characters aren’t overly dramatic and they usually don’t stick to the usual shojo/josei cliches as they move through their lives, which is refreshing. At the same time, they have enough spice in them to keep them interesting. You want to know what makes Chiaki and Nodame tick (I am half-convinced that Nodame has a very mild case of high-functioning autism,) you want to see Mine and Masumi reach their goals (and everyone else too!) It’s just that kind of story. No one really comes close to being truly evil, lending to the human quality of the characters. Nodame Cantabile could be read by almost anyone, unless they’re a total action junkie and doesn’t read manga without any battles. If nothing else, it should be clear that this manga is worth reading because there’s also an anime series and two live-action movies based on the series. You don’t put down that kind of money on a series if it isn’t at least decent or the next Naruto. This entry was posted in manga and tagged classical music, josei, La Corda d'Oro, manga, music, Musical Talent, Nodame Cantabile, shojo, the manga cliche review, Tomoko Ninomiya. Bookmark the permalink.